Adventure Seekers – AWE2013 – footsteps……..
Mark your date from 19 – 20 October 2013 – The 2nd Adventure World Expo (AWE) 2013 sets out to being one of the exclusive and official sports and travel expo aiming to achieve many firsts in outdoor adventure sports exhibitions showcase in Malaysia and also internationally. ‘Motivation, Inspiration and Challenge’ are the focus of this year’s Adventure World Expo as it represents the core values of sports enthusiast and adventure seekers in achieving great heights in their specific areas and activities. 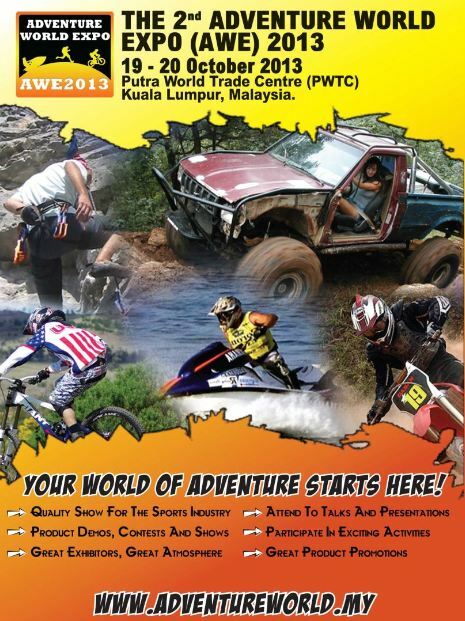 AWE2013 will be the best platform to connect avid sports enthusiast and first time adventurers in Malaysia and all across Asia to get not only information on the available sports activities but also to get great deals and offers on products and packages offered.